As the As Seen on TV Gift Extravaganza comes to a close we have recommended several bizarre and unique gifts: Easy Feet, Fanny Bank, the Purse Hook and more. But none come close to todays gift: The Hair Coloring Brush. Just take a look at the picture and tell me what you think. Hey guys, I know you have heard or even said this before: I am a ‘blonde’ man or ‘brunette’ guy maybe even would like your significant other to be a ‘red-head’ for a day or two. Well, they can now with the Hair Coloring Brush! 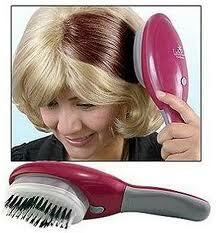 Ladies: The Salon Perfect Hair Coloring Brush gives you salon results right in your own home. The Hair Coloring Brush evenly distributes your favorite hair color fast, safe, and easy. With just 3 simples steps your hair will look amazing. Salon prefect results every time. Even if you have procrastinated for the better part of a year and you went to the mall and fought traffic, gorged a Cinnabon, had your new iPad you bought for your little girl jacked by a gangster, and blew more money on yourself than you should–it is not too late for the gift that will not go un-noticed by your lovely bride! Hurry, order your Hair Coloring Brush right now and hope that Santa gets it in the sleigh before midnight.